Feng shui governs the outside as well as the inside of your home. Consider basic principles when planning a backyard pool and put that water feature to work for you -- instead of against you. Where you place the pool, its shape, and its surroundings can multiply your luck and keep the positive energy flowing toward you. Although a Chinese landscaping precept is "mountain behind, water in front", you can safely locate a pool in the backyard. In fact, by following feng shui principles, a backyard pool could represent not only a good investment; it could draw powerful wealth energy to your house. Black Hat Sect feng shui master Professor Lin Yun shares in a Lushome article that a dynamic water element in the landscaping is essential for attracting the chi energy of money. Just design the pool and surrounding area so it does not slope away from the house, and so it is in proportion to the size of the house. A pool should be visible from the windows but not too close to the house. You need space for energy to circulate and to balance the strong water energy that can douse the fire energy that supports wealth. It is helpful but not mandated to put the pool in the wealth corner of the yard which is the southeast quadrant in alignment with the front door. This matters most if the wealth corner is actually missing from the home; in that case, the pool is a robust remedy to attract prosperity energy. In classical feng shui, the back of the house should be "protected" by raised land, like a mountain or tall barrier. Build a good privacy fence at the property boundary behind the pool as a safeguard and a noise buffer -- to enhance your good fortune and your grateful neighbor's. An oval or kidney shaped pool is preferable because the flow of chi around it is gentle and unobstructed. When the pool curves toward the house, it is directing wealth and luck energy to you. Don't despair if you're saddled with a rectangular pool. Check the corners. If any are pointing toward the house, they are sending a "poison arrow" which is sharp cutting energy that can affect health and wellbeing. Soften those harsh edges with large round planters lush with flowers, decorative rushes, or evergreen plants. Keep thriving plants going year round. Follow that lead for patio furniture arrangements that will be near the pool as well. Avoid too many sharp edges -- round tables and market umbrellas are good -- and adjust furniture configurations so energy is flowing around seating areas and no poison arrows are aimed at the house. Add a waterfall to the pool. 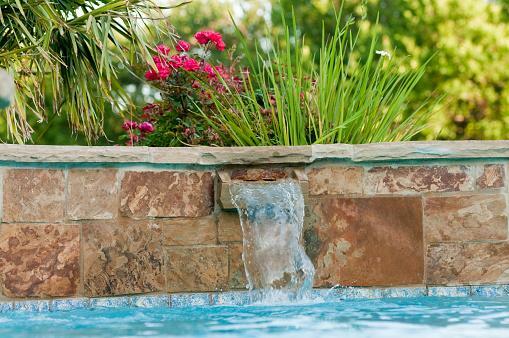 The sound is both lively and soothing and the waterfall enhances the look of the pool. A running filter is also cleaning the water and your pool has to be cleaned regularly to maintain its health and your own. Never allow the pool to get overgrown with algae or the filter to be clogged with leaves. Tall shedding trees and messy plants turn your pool into a stagnant pond. Locate the pool in a clear area, trim overhanging trees, and avoid positioning leaf- and blossom-dropping flora too near the pool. Feng shui is all about balance and the dominance of the water element in a backyard pool requires some off-setting. The earth element is the strongest balance for water, so consider a pool surround of earth-toned cement, terra cotta or brick pavers, or slate. Clay or wood planters, teak pool furniture and cushions in shades of oatmeal, sand, subdued yellow, and a range of browns and beiges are earthy, low-key, and serene. The perfect pool area contains something of every element. Start with earth but then add woody plants and wood furniture for the wood element, and metal furniture and fencing, and a metal fire pit for metal. Don't forget fire. Your pool should be beautifully lit -- no shadowy corners and no harsh stadium lighting. Candles, torches, and barbecues all bring fire energy without overwhelming. Fire's shape is also triangular, so a natural canvas patio sail shaped like a parallelogram, a scalene triangle, a trapezoid, or a pentagon is visually interesting and softens the forceful energy of water. Infinity pools are gorgeous. But they are designed so the water appears to be (and is) flowing away from the home, off into space. In feng shui this is your wealth, draining directly away from you 24-by-7. This is, naturally, to be avoided. 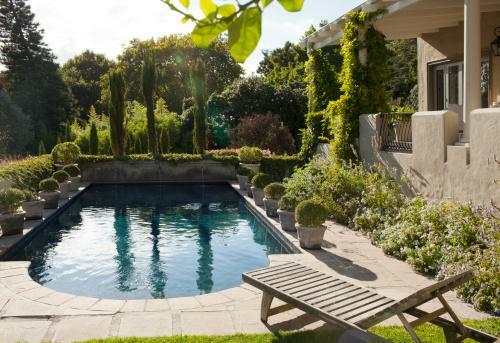 If you must have an infinity pool, you must locate it away from the house, ideally with a landscaping break to separate the pool area from the building. When you are creating a blueprint for an infinity pool, it's probably a good idea to consult with a feng shui master to minimize any negative effect from the pool's design. Treat an above-ground pool with the same care you would lavish on an in-ground pool. The strong water element has the same effect, even when your pool is seasonal, not permanent. Definitely defer to good taste and common sense when searching for balance. Feng shui backyard water feature guidelines will help you to narrow down the multitude of choices you face when planning a pool -- or to fix what feels "off" about a pool that fails at good design.